The entry is based on small-scale, diverse buildings and a fan-shaped alignment of clearly defined blocks. The entry is thoroughly researched and it largely meets the objectives of the competition brief. The street leading from the university to the lake is an inspired idea and a tramline operating along this axis would support the evolution of a vibrant streetscape. A car-free, functionally hybrid centre and innovative blocks in front of the university are a successful concept. Kaijo Square is well placed at the intersection of pedestrian and bicycle routes leading in different directions. The squares are neither too numerous nor too large: two open spaces linked by the main route. The best idea would have been to locate the new commercial centres next to Kaijo Square. The lakes Kuivasjärvi and Pyykösjärvi are linked by a forest corridor, albeit too narrow. If there were a cycling lane running through the forest, there would hardly be any forest left. The merits of the entry are first and foremost in the quality of the regional planning and the connective routes between the different parts of the area. The scale of the residential blocks is perfect and even the parking has been resolved. The one major flaw in the entry was the poor relationship with the surrounding nature. The entry was considered very generic. It could be built anywhere. 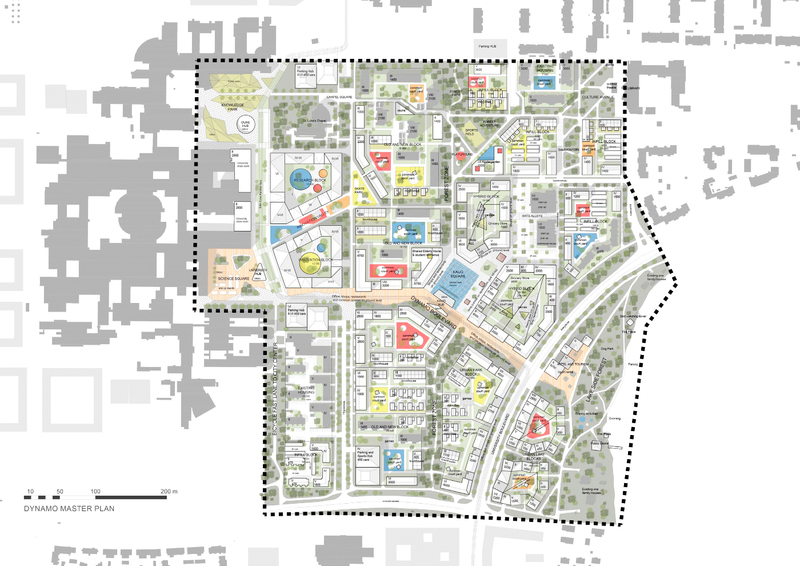 The suggested urban structure takes no account of the architectural and historical values of the existing buildings on the campus or any other qualities of the environment. For example, the long birch-lined axis of Yliopistonkatu has been cut off, although this beautiful feature could just as well have been left intact. 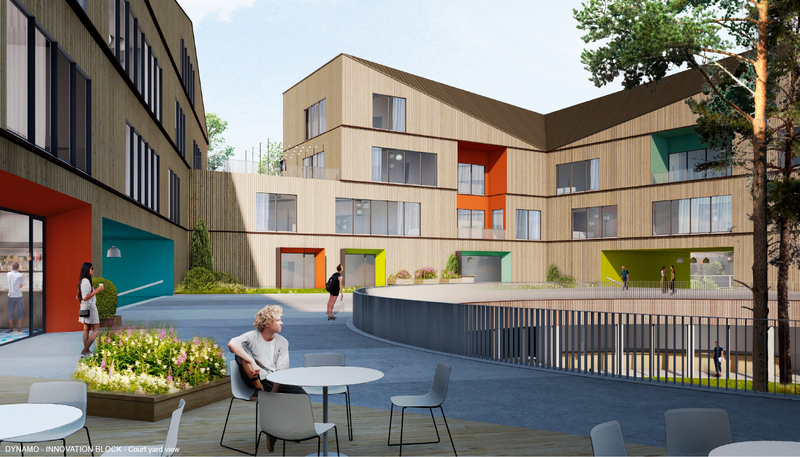 The proposal fails to bring the best out of its surroundings, and the overall concept does not produce a sufficiently outstanding or unique identity for the campus. Kaijonharju center is situated next to the main campus of the University of Oulu. The center has poor connections to the campus area and feels hidden. The visitors and passers-by can’t find their way from the campus to Kaijonharju center and get lost easily. The positive factors of the area, the University campus, Kaijonharju center, Technology Village and beautiful lakes Pyykösjärvi and Kuivasjärvi and the recreation routes are disconnected from each other. Positive factors and good public transportation and bicycle routes create potential for further development. DYNAMO builds clearer links between the main functions of the area. It activates the route from the University campus to Kaijonharju center and makes the distances feel shorter. The focus of the new construction is along Dynamo Boulevard which is part of the new public transportation route from the city center and airport. Kaijonharju becomes a pedestrian and bicycle friendly area where the car routes don’t cut through the heart of the area and the parking solution is regional. The new city block structure is closed, creating urban streets and large common yards. The distinguishing pine trees are saved on the yards and forestry green zones cut through the area. Existing buildings are maintained where it’s possible to create temporal layers. The cars are located centrally in Parking HUBs. The university, services and businesses use the same Parking HUBs to make it more efficient. The Dynamo Boulevard creates a new façade and entrance to the area. 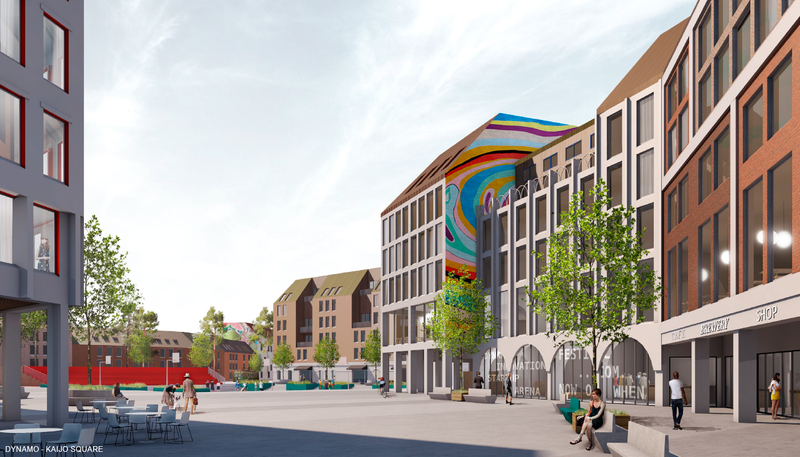 The materials of the buildings and urban areas are taken from the existing buildings, red brick Kaijonharju and industrial and colorful Linnanmaa, and mixed together in a fresh new way. The new digital platform supports the rising of new services and production. It is owned by Kaijonharju residents who can utilize it in their everyday. DYNAMO Boulevard is the heart of the area that’s changing and creating new all the time!